The outdoors is an ideal classroom to engage students intellectually, physically, and emotionally in the "mysteries" or unknowns of the world that surrounds them. For simplicity, our curriculum can be divided into a series of subjects aligned with the Common Core; however, math, language, science, history, and geography are all integrated into complementary studies within our classrooms, inside and out. As you will see, writing prompts often provide a window into life sciences; math becomes visible outside the classroom, with endless opportunities to count, multiply, estimate, and measure. Moreover, our nature-based curriculum works to develop a connection between our students and the natural world (nature connection), with a number of unique activities woven into our daily life at MVCS, such as hiking, fort building, visiting our beloved Fort Creek, and sit spots. 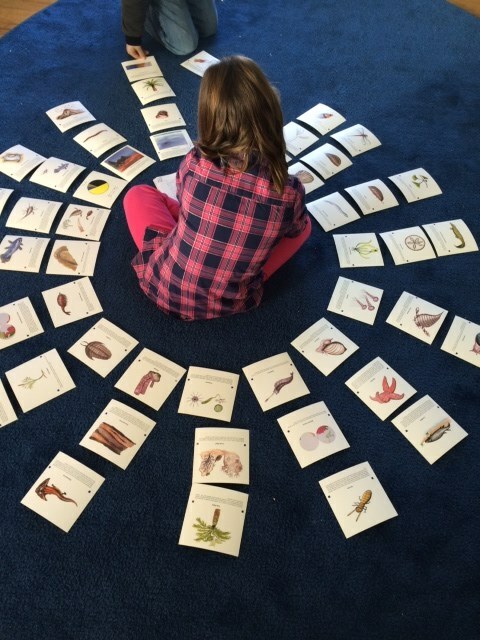 The 3-hour work cycle is an essential element to the Montessori classroom. Having this time allows children to fully engage in their work, developing skills in concentration and independence. During a work cycle, children are able to make developmentally appropriate choices for their own work based on their interests and lessons that have been presented to them. If you stepped into a classroom at MVCS during a work cycle, you would observe learning happening in all subject areas (including the arts and practical life skills!) as well as individual or small group lessons. It's truly inspirational to watch the children taking charge of their own learning and seeing the joy with which they approach their work! In a mixed-age classroom, everyone is a teacher. In a Montessori classroom, children learn that the teacher is not the focus. Though children receive initial presentations from teachers as well as regular check-ins, it is their work in the classroom that provides the most valuable learning experiences. Younger students benefit from their older friends' roles as mentors; older students learn important leadership skills and set the tone for our classroom culture by modeling expectations for our social and academic work.